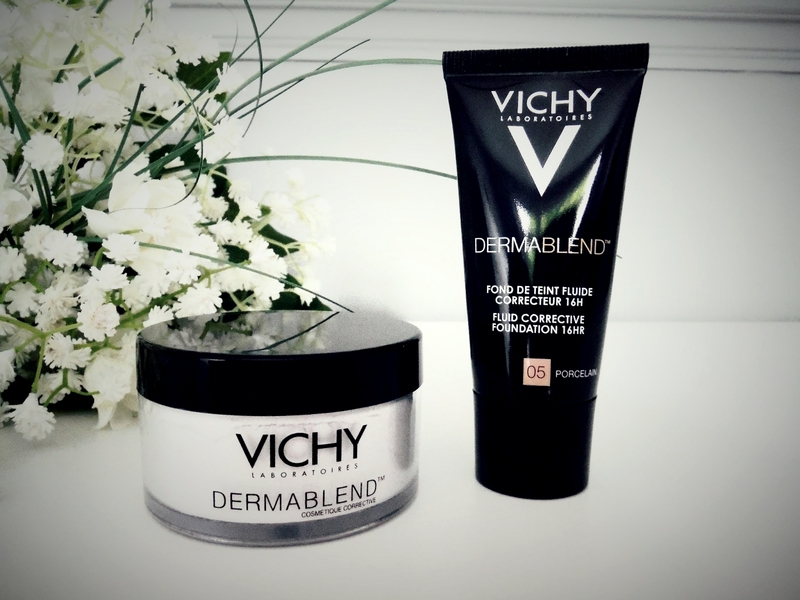 I've seen a lot of people in the blogging world talking about the brand Vichy and how good it is for covering up acne scars and pigmentation, so when I was offered the chance to try out the new foundation and powder I jumped at the chance. I've talked about my struggles with acne in depth on this blog and even when my skin clears up for a few days I'm left with bright red, deep scars from previous spots. I need a high coverage foundation so this seemed like a perfect one to try out! I requested the lightest shade of this foundation, 05 Porcelain, which is actually still a little bit too dark for me but that's not surprising as I have very pale skin and I always find it hard to find foundations that match. It blends out really well though so as long as I carry the foundation down on to my neck it's all good. Compared to the current foundation I have on the go (Bourgois Healthy Mix), this does seem to give more coverage and if you layer it you can achieve a pretty flawless base. I was super happy that it took much less product to achieve the same amount of coverage! The only issue I had with this foundation is that it was slightly too drying for me (I have very dry skin on my cheeks), however I found that using this foundation for my first layer and then building Nars Sheer Glow on top gave me brilliant coverage from Vichy but the formula of Sheer Glow kept my skin feeling dewy and the dry patches at bay. I would recommend this foundation for acne sufferers as the coverage is very good but if you're more on the dry side I would definitely try building with another foundation that you know works on dry skin! I was very excited to try out this product as I've never used a loose powder before and I was curious to see if it would be better than pressed powders. The powder itself is a very good product. It's translucent and applies really nicely, without looking cakey but still giving a matte effect. I didn't notice much shine around my t-zone throughout the day which I was impressed with! The only thing that let it down for me was the packaging. You access the powder by tipping the tub upside down so the powder can fall through these small holes and onto your brush or sponge, however because I suffer with acne, I need my makeup to stay completely in place and I use a lot of powder to do this, but I found that it took ages to get a sufficient amount of powder onto my sponge as only a slight amount fell through at a time. If I can manage to remove the lid that covers the powder so I can access it directly with a brush I can definitely see myself using this powder every day, and if you're someone who doesn't like to use that much powder but still wants their makeup set in place, this is definitely a product for you! Have you tried these products and if so, what are your thoughts? I've been wanting to try this for a while but I tend to have very dry skin around my nose area. I'm not sure if I should try it now! Everyone's been raving about these two products recently and I have to say I'm impressed by the review by the powder, it sounds amazingg! Great review! I don't think the foundation sounds right for me as I also have combination skin, though the powder sounds awesome! Ooh okay, the powder sounds a lot nicer than the foundation for me.